Leadership Lumpkin County is a community awareness and education program designed to acquaint existing and emerging community leaders with current and future issues, needs, services and resources in Lumpkin County. The hope is for classmates involved to contribute to the enrichment of our community in Lumpkin County! 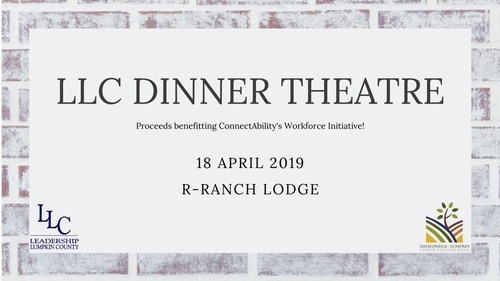 A group of 2019 Leadership Lumpkin class members have put together a fundraiser for ConnectAbility called "LLC Dinner Theater". All proceeds from the event will benefit ConnectAbility's new work initiative which will help employ individuals who have disabilities. The LLC Dinner Theater will be a Murder/Mystery themed dinner held at the R-Ranch Lodge on Thursday, April 18th.